The United States Supreme Court has ruled that President Donald Trump’s arbitrary ban on transgender people from the military may go into effect despite multiple lower court rulings against it. The decision could have an immediate impact on the thousands of transgender people currently serving their country. The justices split on the decision, with the four liberal judges voting against lifting the ban. Trump tweeted his decision to discriminate against trans service members unexpectedly in July 2017, catching military leadership and activists off guard. Trump hosted a group of far right evangelical activists shortly before announcing his surprise decision. There are currently four lawsuits against Trump’s transgender military ban, and plaintiffs successfully asked for injunctions against implementing Trump’s transgender military ban in those cases. Earlier this month, though, a court of appeals overturned the injunction issued in Doe v. Trump, a case that originated in D.C.
Today, the Supreme Court refused the Trump administration’s request to review the lower courts’ preliminary rulings, but it issued a stay on the other injunctions. This means that the trans military ban can be implemented as the cases work their way through the federal court system. Ruth Bader Ginsburg, Stephen Breyer, Sonia Sotomayor, and Elena Kagan dissented from the decision. The White House’s argument was that the injunctions were bad for democracy and were part of a growing trend of lower courts issuing nationwide injunctions while challenges to Trump administration policy. Lawyers for the transgender servicemembers told the court that the current policy is one of open service, and the lack of evidence that the ban will accomplish anything positive means that it should not take immediate effect. “Our country owes a debt of gratitude to the thousands of transgender people serving in our armed forces,” said NCLR Legal Director Shannon Minter. 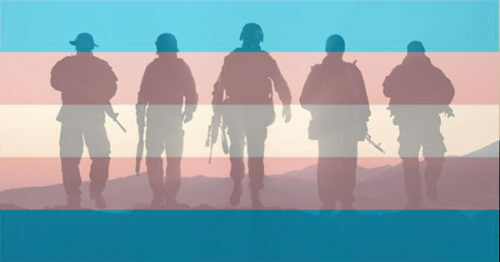 “For more than 30 months, transgender troops have been serving our country openly with valor and distinction, but now the rug has been ripped out from under them, once again,” said Peter Renn of Lambda Legal. Alex Bollinger contributed to this article.